Automation is happening at a new level in the workplace now. This is because of the recent advances in the fields of robotics and AI. Whereas these advancements are likely to create some new jobs in the many industries where robotics is used, some other old ones may be wiped out altogether. The aviation industry is no exception. What about the planes which roll out of assembly lines? The very fact that planes do not fall apart when flying is due to the 60000 and more rivets which keep the Boeing 777 in one piece. It requires two humans to put these rivets in place. The result is, of course, tired shoulders and stress injuries to the back and arms. Boeing decided to put an end to this by installing the Fuselage Build System in the year 2015. Robots work in pairs just like humans and save on time, healthcare costs and productivity. If you want to know what robots do on the inside of the planes, there are companies that are building robots to upgrade aircraft inspections for the purpose of their maintenance. Robotic inspections of the aircraft can reduce the time involved from hours to just minutes. This would keep the maintenance engineers free enough to do other jobs. Currently, remotely controlled robots send high-resolution images after inspections of the aircraft surface (normal, wet and upside down) to a ground-based crew. They can then assess and decide whether repair is required. These robots can be upgraded to do ultrasound and thermo-graphics checks in the future. SR Technics in partnership with Invert Robotics will soon be working with Air New Zealand to install these climbing robots for trials soon. Boeing is now part of the autonomous aviation sport: their goal is to build jet planes that will fly on their own. There are no pilots needed. They have started building systems in this direction with basic building blocks that are already available. Autopilots are known to take over flights in less than 10 minutes after take-off and guide them to land safely even in rough weather and poor visibility conditions. Lightweight robots like the SR-SCARA-Pro has been developed with the ability to test commercially produced aircraft panels in the cockpit remotely. The robot is capable of performing pre-flight checks of the instrument panels in the cockpit and makes the flight ready for take-off. It works to physically activate switches and toggles and check other touch-panel functions. These have to be rigorously tested before every flight. Many airports in the world have started using robots for a variety of activities that human were earlier doing: passenger interaction, cleaning and law enforcement. Over and above this, recent studies indicate that over 40% of the many activities that humans do and are paid for can be automated with just the existing technologies. This is across many roles that humans normally do in the aviation industry. 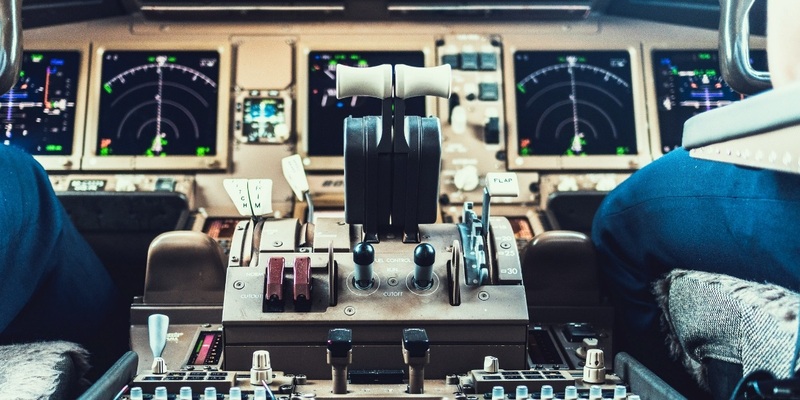 More than 60% of the current jobs can be automated by over 30 per cent and about 20% of different role that humans play in the aviation industry can be automated to a whopping 70%. All this tells us just one thing: there will soon be significant changes in the job roles in the near future. Read on to find out the different job roles that robots have been assigned to do in some of the airports of the world. Many airports have started using robots to help passengers get answers to their queries, act as guides, provide security and cleaning services and even provide entertainment. This robot named Spencer is being tested to act as a guide for passengers (KLM airlines) by leading them to their respective departure gates. Spencer has been taught to scan the boarding passes and guide them to their respective departure gate. The robot is programmed to adjust its speed while avoiding obstacles on the way. Spencer also flashes the distance to the departure gate on its screen. This robot has been built with involvement from universities, KLM, the Hogeschool Aachen, SME Bluebotics and the Centre for National Scientific Research (CNRS). This robot helps those that end up missing their flights because of language barriers and because they cannot find their way. With the airlines more determined than before to smooth this problem out, Spencer is a socially aware robot that determines whether the traveller is single or part of a group and is programmed to act in a friendly way with humans. Such roots can help ease the pressure on humans that are working overtime in this environment. This type of robots can also be used in other environments such as factories and homes. Pepper is a humanoid robot you can find in the Pyramid Ale Taproom (Terminal 2 of the Oakland Airport). Developed by Softbank Robotics, Pepper offers advice of food and drink selections to its customers. It also serves to inform passengers about directions to departure gates, restrooms and the baggage cloak via an interactive map on its chest. These types of robots have already worked in other places such as schools, shops and restaurants in the US. In the year 2016, the three robots were used to serve and entertain airport guests. Developed with efforts from the South Korean Future Robot and 22Miles from Silicon Valley, these robots entertained the passengers and provided directions for dining and shopping in the airport. Information was displayed on a touchscreen in five languages: German, Japanese, English, Spanish and French. They could play music, dance and even take photographs that could be emailed out. With the growth in air travel and commerce, demand for skilled manpower is at an all-time high and employees are working overtime in stressed environments. Robots can help to reduce this pressure on humans and provide faster output while simultaneously providing superior work efficiency, freeing humans to do other jobs at a more comfortable pace.